Inside the February issue, our new series ‘The great indoors’ will give you fresh eyes and help you look at your home from your cat’s point of view, plan your purrfect 2019 days out, and read our exclusive interview with the Supervet. Plus, inside the new exhibition celebrating cats in literature, we take a look at some of the cats who have inhabited the Earth's coldest places, and your chance to win over £1,250-worth of feline freebies! It’s not enough that cats have a warm house with a cosy bed, a bowl of food, fresh water, and a lap to curl up on. Whether your cat spends all or some of his time indoors, his home should be his kingdom — an environment that is fun, challenging, and allows him to display a repertoire of natural feline behaviours. And I’m sure that everyone who is reading this wants to achieve that! Behaviourist Clare Hemington’s new series ‘The great indoors’ will give you fresh eyes and help you look at your home from your cat’s point of view. Each month, she’ll be focussing on a different resource within the home and how you can optimise it to keep your kitty as happy as can be. But, this isn’t about spending lots of money and turning your home into a feline playground, it’s about small tweaks that will make a big difference to your cat’s happiness — everyone can do it! Hopefully you enjoyed Dr Lauren Finka’s first feature in her new series last month, introducing us to ‘The science of cats’. Her next instalment is featured in this issue and, I don’t know about you, but I think it’s great to have someone like Lauren on board, keeping us in the loop with the latest feline research. I really enjoyed reading her feature this month all about whether cats’ facial expressions help them get adopted more quickly — hopefully you will too! 2019 is now in full swing but, let’s face it, February is a bit of a miserable month. So, it’s time to get your diary out and plan some fun days out and adventures for the year ahead. 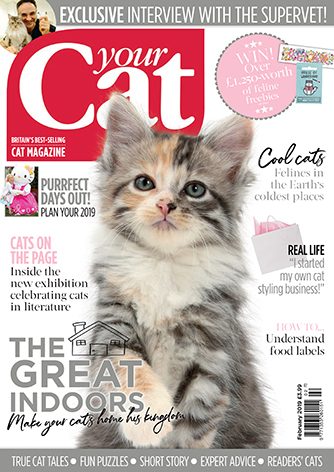 Our ‘Purrfect days out’ feature on page 48 will give you plenty of ideas — and they all feature cats.